Because pigeons tend to breed and roost in groups, the build-up of pigeon feces on buildings and other structures is visually unappealing. In addition, pigeon droppings are acidic and erode metal and stonework. 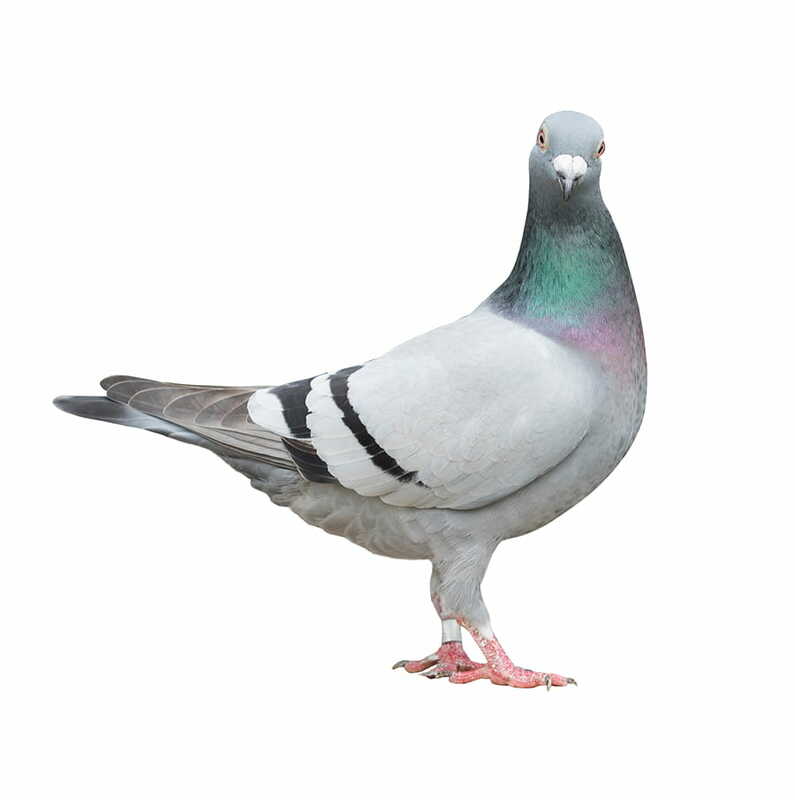 Pigeons have also been associated with a variety of diseases, including histoplasmosis and cryptococcosis. Often described as "rats with wings," pigeons are found in nearly all environments where people are found. In fact, pigeons are highly dependent on people to provide them with food and nesting sites. Pigeons are primarily seed eaters, however, they will also feed on nearly anything provided for them by people. Pigeons are stout-bodied birds with short necks and short, slender bills with a fleshy cere. 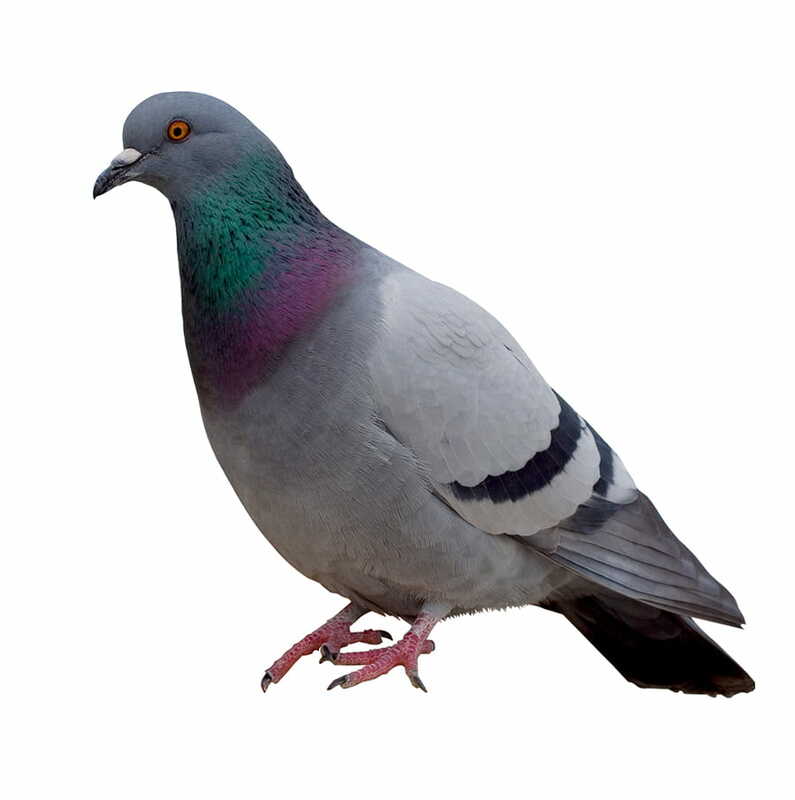 Typically, a pigeon will have a gray body (although body colour may range from white to tan to black) with a white rump, a wide black band on the tail and red feet. The average weight is approximately 369 g (13 oz. ), and they will reach a length of 28 cm (11 in.). They are found throughout North America and are the most common of bird pests. Their distinctive 'clicking' sound which is made during flight, occurs because of their wing tips touching while they are beating. Pigeons are an adaptable group of birds that can live and thrive in various habitats. In urban cities, tall buildings and window ledges simulate the natural cliffs where wild pigeons live. Pigeons use man-made spots such as lofts, steeples, attics, pipe manifolds, girders and corrugated metal roofs to roost, loaf and build their nests. These birds also make a nuisance of themselves by living and feeding around farms and grain storage elevators. Breeding will occur throughout the year and consequently, large populations can develop in a relatively short period of time. Once a pigeon acquires a mate (they are monogamous), one or two eggs will be laid within eight to 12 days. At four to six weeks, the young are ready to leave the nest, but even before this occurs, more eggs will be laid. Pigeons can live up to 15 years, however, factors such as disease, lack food and water and predation from other birds and mammals prevents this. In the wild, pigeons usually live three or four years. Where do pigeons prefer to roost in urban areas? Pigeons will inhabit any areas where they are able to land, which offers shelter, which they are able to move about and in areas where there is food and water. Such areas include lofts, steeples, attics, ornate architectural features of buildings as well as window ledges, pipe manifolds, girders and ride corrugated metal roofs. What does a pigeon nest look like? Pigeons will build nests out of sticks, twigs and grass. However, they may also use materials such as yarn and string if they find them. Nests are more like platforms, not like the typical songbird nests which we see in trees around our parks and neighbourhoods. How often do pigeons reproduce? Once a pigeon acquires a mate (they are monogamous), one or two eggs will be laid within eight to 12 days. At four to six weeks, the young are ready to leave the nest, but before this occurs, more eggs are laid. Breeding will occur throughout the year and consequently, large populations can develop in a relatively short period of time. Peak pigeon reproduction occurs in the spring and fall. How long does a pigeon live? Pigeons in the wild usually live for three or four years. They are capable of living up to 15 years, however, factors such as disease, lack food and water, and predation from other birds and mammals prevents this. Can large populations of pigeons do damage to the structures where they roost? Yes. Even small populations of pigeons can cause a great deal of damage, both structural and aesthetic. The acidic nature of their droppings cause building materials to deteriorate, and damages exterior finishes. Marble and other masonry may be permanently stained, and the appearance of droppings on exterior walls, windows and floors is unsightly and requires much time and money to remove on a regular basis. Pigeon droppings on an unsuspecting pedestrian is never good, particularly when that pedestrian is a potential customer entering your place of business. Do pigeon infestations create potential health hazards? Yes. 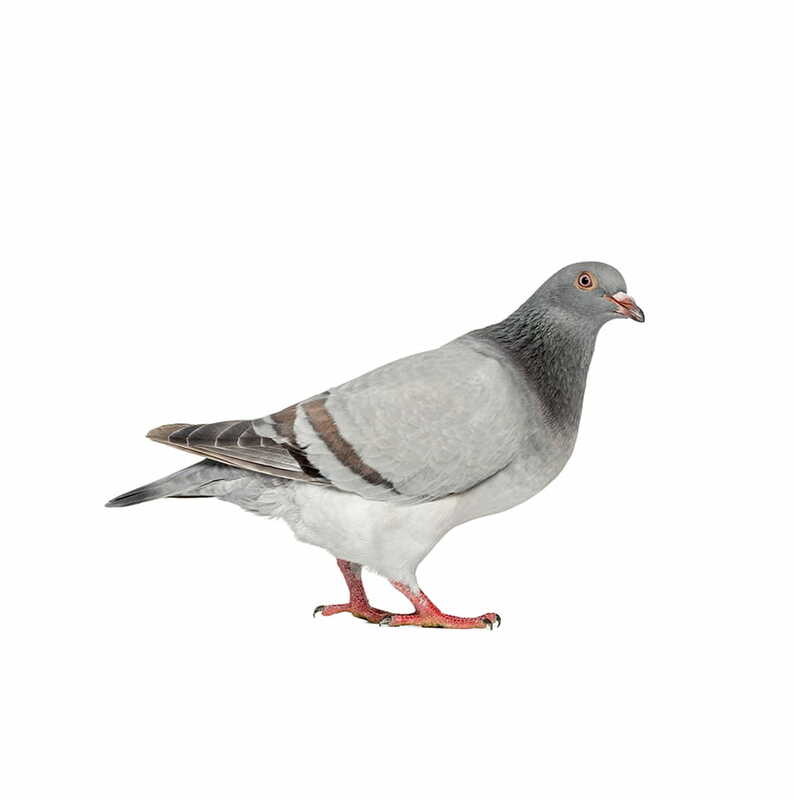 Pigeon droppings contain the organisms responsible for diseases such as Ornithosis, Encephalitis, Cryptococcosis, Toxoplasmosis and Salmonella, to name a few. Buildings which have large pigeon populations constitute health hazards for the occupants of those buildings. Huge stores of food, intended for human or animal use, can be contaminated by pigeon droppings in silos, storage bins and other grain handling facilities. Other organisms may exist in old, dry droppings, and in empty nests, and are transmitted to humans through inhalation. Ectoparasites of pigeons, such as lice, fleas and mites, may also affect people if they are in close proximity to nesting areas. The northern fowl mite is a very important pest of poultry, and is found on, and transmitted by pigeons. These points illustrate the importance of eliminating pigeon infestations, thoroughly cleaning areas where they once roosted, and preventing re-infestation. How can pigeon infestations be prevented? Long term control requires the elimination of sources of food, water and shelter. Unfortunately, these processes can be extremely costly and, in most cases, are highly impractical as they often require the modification structures and landscapes. Exclusion is practical and affordable method of control, and it is highly effective if done properly. Exclusion involves eliminating access to lofts, steeples, vents, girders and eaves with metal, glass, screens, wire mesh and plastic or nylon netting. Roosting may be prevented through the use of mechanical repellents often known as Porcupine Wire. These materials consist of numerous metal or plastic prongs which project upwards at different angles. When strategically placed on a surface, pigeons are prevented from landing. Other means of prevention include the non-toxic repellents which, when applied produce sticky surfaces which pigeons dislike and will not land on. Sanitation is essential around residential, businesses and farms. Sources of food and water should be eliminated, and people should be discouraged from feeding pigeons in public areas. The safe and proper removal and exclusion of pigeons from a structure can be a difficult and time-consuming endeavour and should be done by professional pest control technicians.